My husband and I run a youth football program in Palmdale called Knight Hawks Youth Football and Cheer. We’ve been running the program without much help for five years. We ordered our uniforms online through a company called West Coast Team Apparel and dealt with the owner Herb Fullerton. On Sept. 3rd, Mr. Fullerton sent an email to my husband saying our uniforms were ready and that he needed final payment. I sent him out final payment, and to date, we still don’t have our uniforms. After the Sept. 3rd email, Mr. Fullerton started ignoring our call, texts and e-mails. He had sent me a sample jersey via fed-x, and I was able to find out that he has the uniforms manufactured at a company called Rioxin Sports in Pakistan. I sent an email to Rioxin and received a response from them saying they were waiting for payment from Herb Fullerton. Ever since, I have been going back and forth with both Fullerton and Rioxin with each one saying the other is lying. The worst part of this is that our players are suffering because they don’t have uniforms, and we’ve played four of our eight games already. We have upset parents and kids. Since we paid for the uniforms, and parents still owe money, we don’t have the money to replace the order. I guess I’m sending this message so no one else will use either one of these companies. The company in Pakistan, Rioxin Sports said they would send our uniforms if we send them a partial payment. If your readers could help us with the $1,800 payment, that would at least allow us to get our uniforms while we take legal action against Mr. Fullerton. Editor’s Note: The AV Times contacted West Coast Team Apparel owner Herb Fullerton. He confirmed that Knight Hawks Youth Football and Cheer paid his company for uniforms that were not delivered. “I don’t make [the uniforms], I’m just the middle man,” Fullerton said, adding that a manufacturing company in Pakistan had walked away with the team’s money and was not returning his calls or emails. Fullerton said he also has a youth sports team, and he said the Pakistan company had failed to produce uniforms for his team, as well. Fullerton said the entire situation had caused him an untold amount of stress and was putting him “in bankruptcy.” He said he was committed to resolving the situation with Knight Hawks Youth Football and Cheer but could not say when it would be resolved. 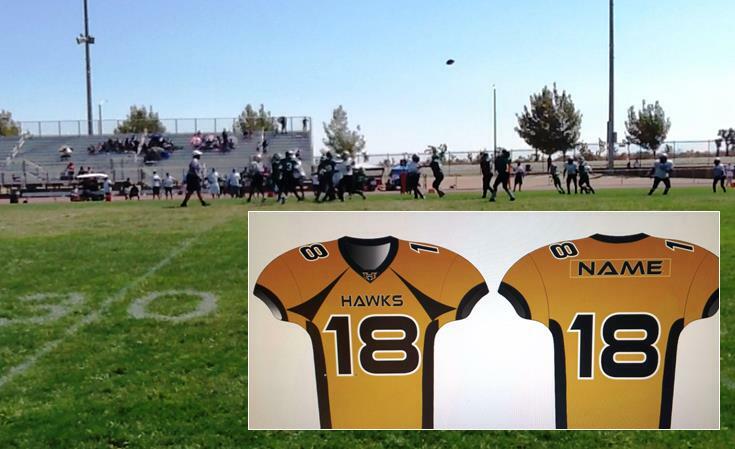 Knight Hawks Youth Football and Cheer is out $4,000 for undelivered uniforms, according to the team’s owners. To help the team come up with the additional $1,800 needed to salvage the uniforms order, or to offer any other assistance, contact the team’s board members at http://www.knighthawksyouthfootballandcheer.org/Contact-Us.html or email Dawill521@sbcglobal.net. 25 comments for "Company scams youth football team, how you can help"
Since parents paid money for uniforms, at least most of them, perhaps in lieu of seeking donations from the community, seek a small loan, get uniforms for the players, honor the commitment to the families who trust you and to whom your responsibilities lie, and move on. Sue all parties, take action and fight. But most of all, accept responsibility for your team. Or take money from your own savings? I would personally sue this Mr. Fullerton on Judge Judy’s show. Imagine the stuff she would do to him!!!!!! God I would never pay that amount of money for such badly designed proofs in the first place. I would rather invest in a local company and pay for quality in-person services. Sorry this happened to your team! Hope you recover your losses. Here’s West Coast Team Apparel’s website http://www.wcteamapparel.com/ and here’s their terms and conditions http://www.wcteamapparel.com/Terms___Conditions.html and if you read it, I think they look pretty sketchy. Also they are really really long! Career Uniforms in Palmdale. You can reach him at careeruniforms@sbcglobal.net. Really Good! Also I’ll will be donating but please be more carefull and support the local mom and pop, Family stores in our community let any store in our community know what happen I’m sure they would help in some way. You need to go to A.V. Sports and order from them instead of trying to save a few bucks because you let parents not pay there fees. I’m sorry this happen to you but for 5 years running this program you would think you could have built a relationship with a sports store I’m sure any sports store that does this sort of thing would appreciate a returning costumer and make some sort of deal to have you return every year. Please don’t give this people anymore money and if you decide to do it a C.O.D. Would work just fine if the product doesn’t get there you just don’t pay. Lesson learn good luck to your team. If they want to save money don’t go to AV Sports that guy will rip you off ten times more!!!! Sounds like it is time to contact the state Attorney General in Sacramento. If this guy has done this to other teams try to get them to join you in filing a complaint about his actions. File a complaint against West Coast Team Apparel at http://www.ripoffreport.com – many people check there to see if a company is a scam before doing business with them. Does Herb Fullerton have any proof that he sent the money to Rioxin Sports? I am sure he does not send envelopes full of cash to Pakistan, he MUST have a transaction record he can show – if not, then HE is the one pulling the scam. Sue his pants off. And learn a valuable lesson – some websites can look professional but can actually be a struggling business run out of someones garage by one or 2 people, and $4000 was simply too tempting to resist taking. Find a site that has good reviews from customers you can verify. And just to be on the safe side, I would not send any cash to Rioxin Sports. I’m sorry, but there is no way I would donate money to send to the same people who screwed you to begin with. If they screwed you once, why would you assume they wouldn’t do it again. It’s common sense. It would make more sense (and be better judgement) to spend the $1800 with another company who does everything “in house”. There are tons of other companies that make uniforms. Go to someone else. And maybe the football/cheerleaders can hold some type of car wash or fundraiser to help make some of the money as well. On a side note, I don’t believe Herb Fullertons story as well. I don’t believe he has his own youth football team and I don’t believe he is also getting screwed. He is making excuses. It doesn’t matter if he is the middle man. He is still responsible. The Knights are in a business contract with him and his company…not the company in Pakistan. They can sue him directly and he in turn can sue the Pakistan company. It’s not the knight football teams responsibility to deal with the Pakistan company at all. Stop getting the run around and do something about it! If the company in Pakistan is willing to work with you. You should have them sent it as POD (PAID ON DELIVERY) if they refuse, then that should tell you that they are fraud. And use any donation money to buy local uniforms here in the AV. WHY WOULD ANY ONE DO BUSINESS WITH A COUNTRY THAT SUPPORTS TERRORISM! MR. FULLERTON, SHOULD BE CHECKED BY THE FBI AND NSA AND THROWN IN JAIL FOR DOING BUSINESS WITH A COUNTRY THAT SUPPORTS TERRORISM!! If the order was made online, it was not made with cash, it was made with a credit card. The Williams simply need to file a claim with the credit card company that they used and the money will be returned to them. There is no need for contributions from the community. Your assuming this order was made on someone’s credit card, but my experience with these sorts of things leads me to believe the parents’ payments were deposited into a team bank account. The middle man more than likely took the funds for the uniforms through electronic funds transfer (same as cash) because that is the only way he would be able to pay the Pakistanian company, which then scammed everyone. If you don’t want to contribute, fine, but don’t try to demean the effort and make assumptions, especially when you have obviously never managed a community youth team! Didn’t this just happen last year? Yes it did! Lancaster Eastside Lions had a similar thing happen last year for basically the same reasons. Rather than support local businesses in the AV that have been fulfilling youth sports apparel orders for 30+ years they go to an unknown source. Not only did they NOT get their order, but they jeopardize jobs in the Antelope Valley. Fool me once shame on you.. PLEASE do not give this man Herb, or Rioxin Sports, the Pakistan company, any more money. Count your losses and deal locally. This guy has been doing this for years to youth groups, Eastside I know and some other teams around the valley he needs to be stopped. BTW he is the middle man but he is responsible your deal is with him not pakistanian company. take him to court and file against him.